When it comes to college fair giveaways that stand out from the clutter, TANGIBLE and DIFFERENT are essential features in this digital world. Put your campus at the head-of-the-class for the next college fair, and see why other colleges and universities are using BookWear®. Prospective students shop college fairs looking for the best fit. This includes first impressions, the campus presentation, and the gift they walk away with. Make sure that “giveaway” tells the campus story in a positive, creative, and novel way the student will remember and fix at the top of their impressions. For over 30 years, BookWear products have served as highly-effective tools for marketing, recruiting, public relations, and communications. 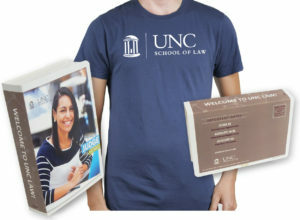 Many universities use BookWear as college fair giveaways and recruiting gifts to reach prospective students. But what exactly is BookWear and what makes it one of the best college fair giveaways? This little “book” tells your campus story. It’s small, prewrapped, attractive and easy to give to a student. And most of all, it’s different! It looks like a book but there’s a surprise inside that makes it compelling to open. Your message, campus photos, graphics and text go on the cover. Inside is the surprise gift with the campus logo. It can be a t-shirt or 30 other gifts. Give out 1,000 of these little message “books” and imagine the smiles you get from the students. What terrific marketing! To have 1,000 prospective students advertising your campus to their peers? Every new student wants to hear “Welcome” and “Congratulations on Your Acceptance”. Those are great headlines on the book cover and they are music to the ears and heart of any student. Choose from thirty gifts to go inside the book; compressed t-shirts, USB drives, sunglasses, custom beanies, etc. Add additional information on a pamphlet to go inside. In addition to serving as college campus giveaways at college fairs and events, this book mails like a thick postcard. We can even mail it for you. Templates are supplied for the campus art staff to design the book, or we’ll do it for you. Request samples and information by contacting your promotional products distributor. Every year for fourteen years the University of Georgia mails out 11,000 to 22,000 of these little “books”. The front cover says “Welcome” to new students. The back cover says “Commit to Greatness”. Inside are Georgia sunglasses and a card, “Commit To Your Future. Now that you’ve been admitted, there are certain steps you can take to make your transition to the University of Georgia a smooth one.” It lists dates, actions and contacts for students for admission. Unlike other college fair giveaways that get lost in the clutter, BookWear is a fun and exciting gift for students as well as a guided path to admission. 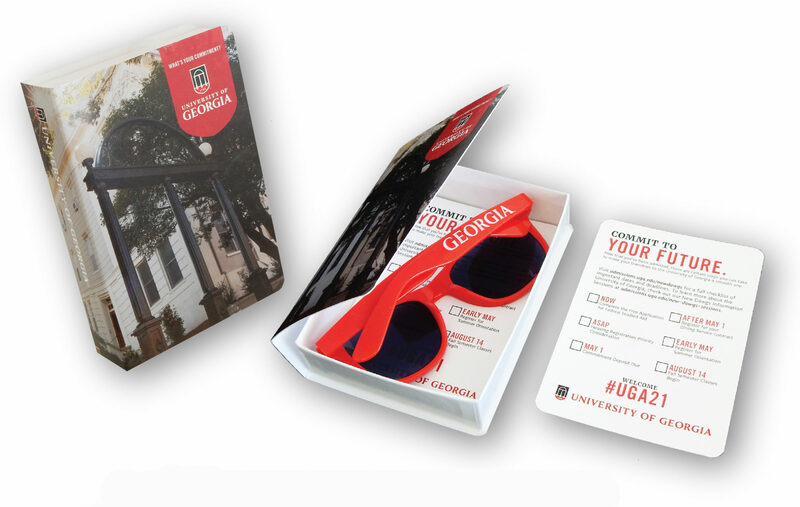 It makes effective marketing and recruiting for the University of Georgia. It’ win-win for the university and for the student! It has a huge open rate because it’s unique and there’s obviously a surprise. 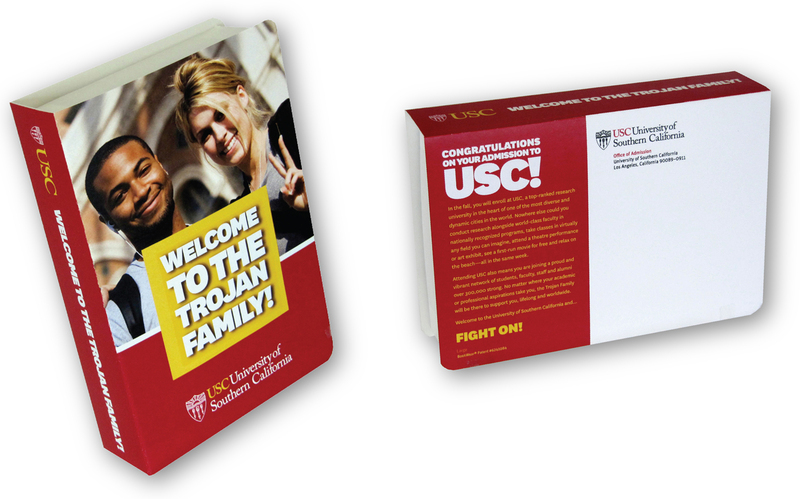 There are hundreds of colleges that use this “book” to say “Welcome” to prospective students: University of Southern California for 14 years, Baruch University for eight years, Oberlin for fifteen years, etc.. It’s a “Best Seller” for higher education. We live in a virtual world that’s flooded with electronic messages, so much it’s like raindrops going by. 97% of them we don’t notice. Social media becomes social-blah-blah-blah. TANGIBLE and DIFFERENT are essential features in this electronic world. They will get you noticed! “Surprise is the most powerful marketing tool.” says Harvard Business Review. It’s true, especially when it comes college fair giveaways and events filled with clutter. Add the element of surprise to any package and it gets remembered. Tell your campus story in a fun and creative way and new students will put you at the head of their class! BookWear® is a powerful recruiting and admissions tool for all types universities and college campuses. Read what some of our customers have to say below. For BookWear® information and ordering, contact your preferred distributor. If you need a distributor referred to you please email info@bookwear.net. In addition to college fair giveaways, BookWear is a great tool for student orientation and various other creative applications. Thank You!